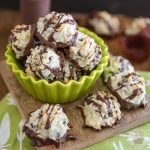 No one needs to know just how easy this spectacular Nutella Amaretto Fudge Recipe is to make… perfect for your next party, or to give as hostess gift! 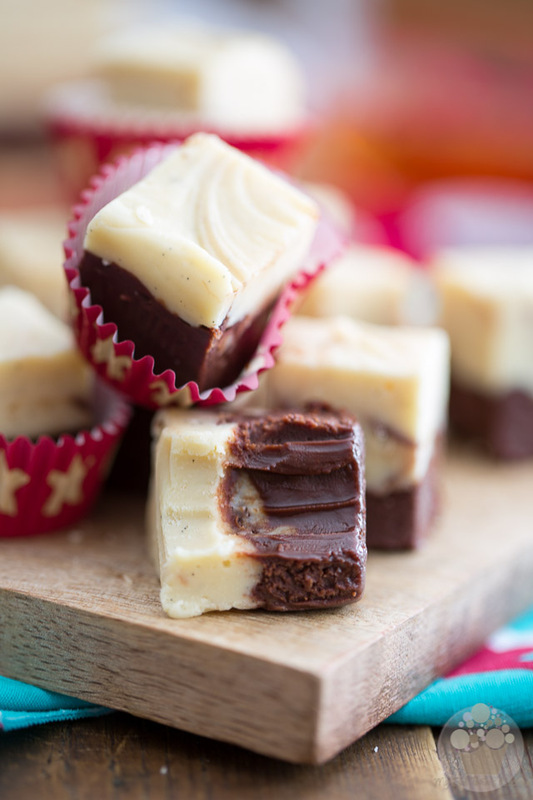 Christmas without fudge just wouldn’t be Christmas, now would it? 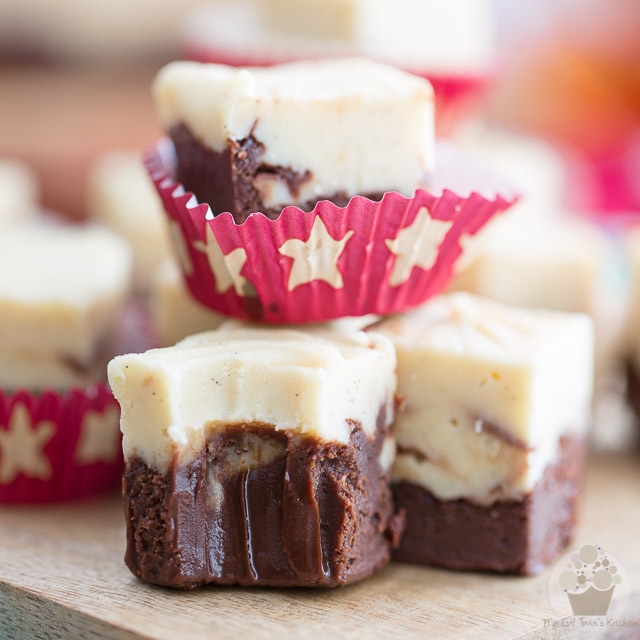 And can you think of anything that says Christmas better than this Nutella Amaretto Fudge? I’m so all over this flavor combination! Mind you, Amaretto happens to be among my favorite classic Holiday boozy treats, so of course to me this totally screams Christmas. 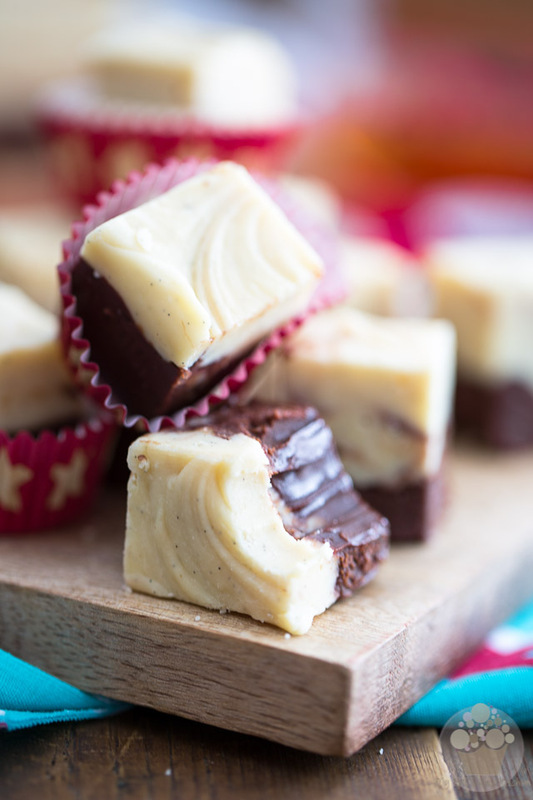 This fudge is not only a real delicacy to bring to your next Christmas party, or to offer to your guests as an evening treat with their coffee, but it also makes for a perfect hostess gift! As you can see, I chose to make my fudge in a loaf pan because firstly, I think that nothing can quite beat the sensation of biting into a really THICK square of fudge, but also too because I like how the thickness of the fudge allows you to simply cut it into strips and then wrap those strips in cellophane paper to offer as little presents. Strips of delicious fudge wrapped in cellophane = elegant and tasty hostess gift. I sure wouldn’t mind being handed one of those! Lucky for me, I happen to have this entire batch at home, just waiting to be enjoyed. Sorry guys… not sharing. 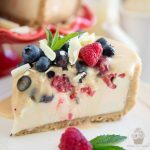 You’ll have to make your own! 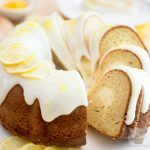 The first thing you want to do is grease the bottom and sides of a loaf pan with butter and then line the pan with parchment paper, leaving a bit of an overhang on either long sides. Then, bring the Amaretto liqueur to a boil and let it simmer until it’s reduced down to about 2 tablespoons. This will not only concentrate the flavor of the liquor, but it will also rid us of a lot of unnecessary and unwanted liquid. While the booze is reducing, work on the Nutella fudge: combine half a can of sweetened condensed milk, the chopped semi-sweet chocolate, Nutella, butter and salt in a medium-sized bowl. Throw that in the microwave for 1 minute and then allow the mixture to rest undisturbed for 1 full minute. Then and only then, stir delicately for 1 full minute, until the chocolate mixture becomes really smooth and silky. If you find that the chocolate isn’t completely melted by then, repeat the process again and as many times as necessary, but for no longer than 20 seconds at a time. 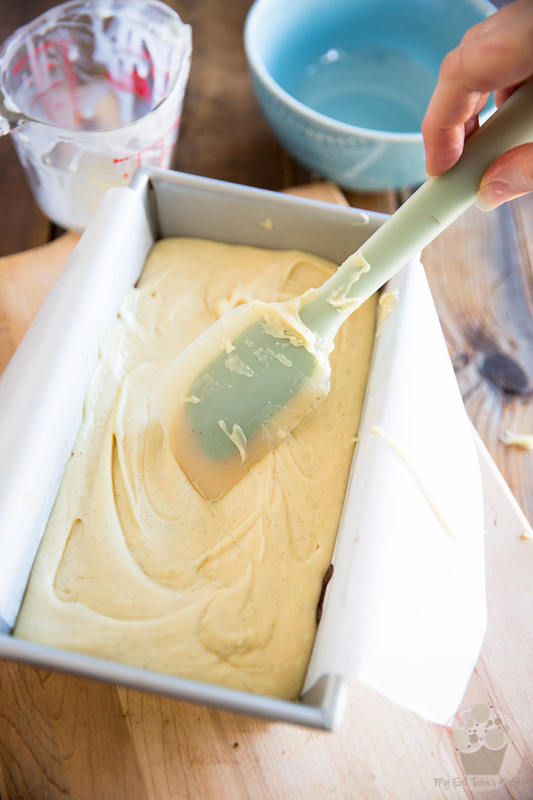 …and use a rubber spatula to spread it all the way to the sides. Now to make the Amaretto fudge… Add the rest of the sweetened condensed milk and seeds scraped from the vanilla bean to the pan with the reduced Amaretto in it. 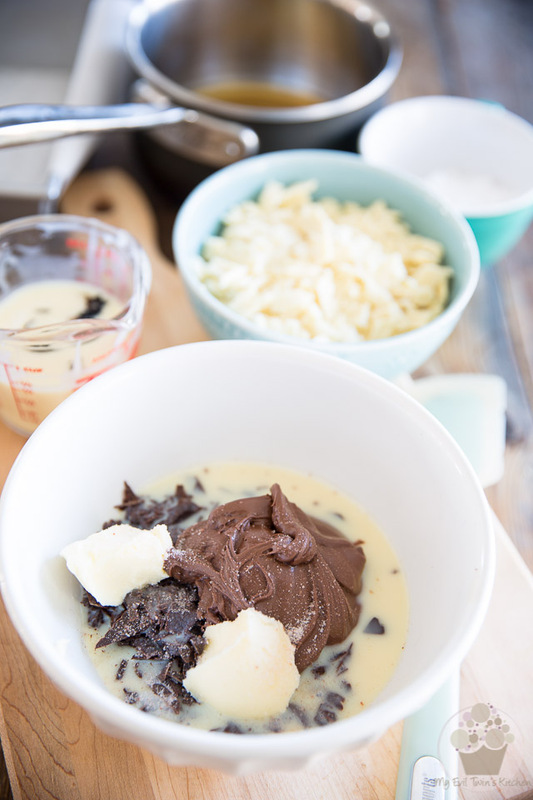 Stir until well combined and then throw in the chopped white chocolate. 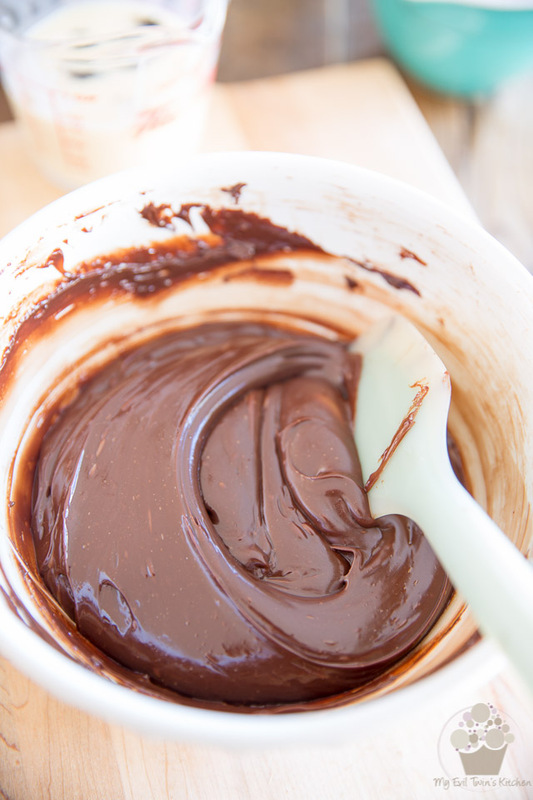 Cook this over low heat, stirring constantly, until the chocolate is completely melted and the mixture is silky smooth. 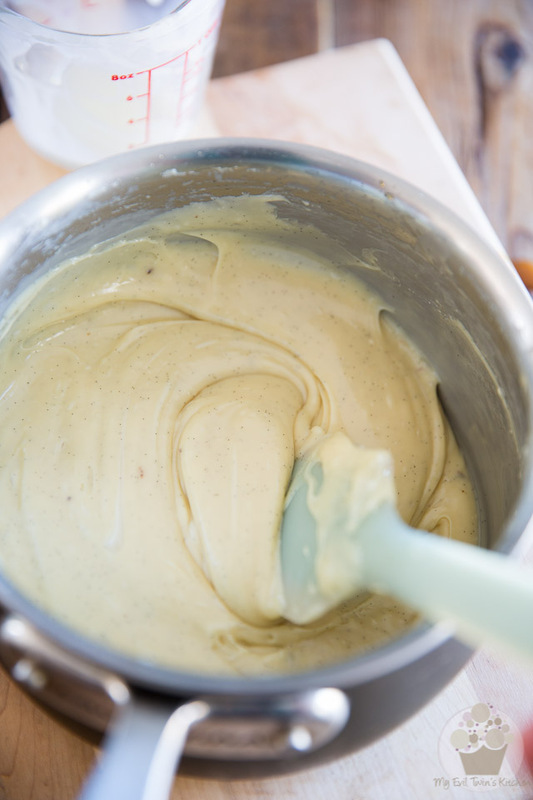 …and again, spread all the way to the sides with your spatula. Finally, swirl the fudges with a long wooden skewer or chopstick and refrigerate until firm, about 3 hours. 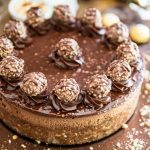 Don’t go crazy overboard when you do those swirls, but don’t be afraid to really go deep and bring some of that Nutella fudge over to the top. You want both layers and colors to sort of blend together some. 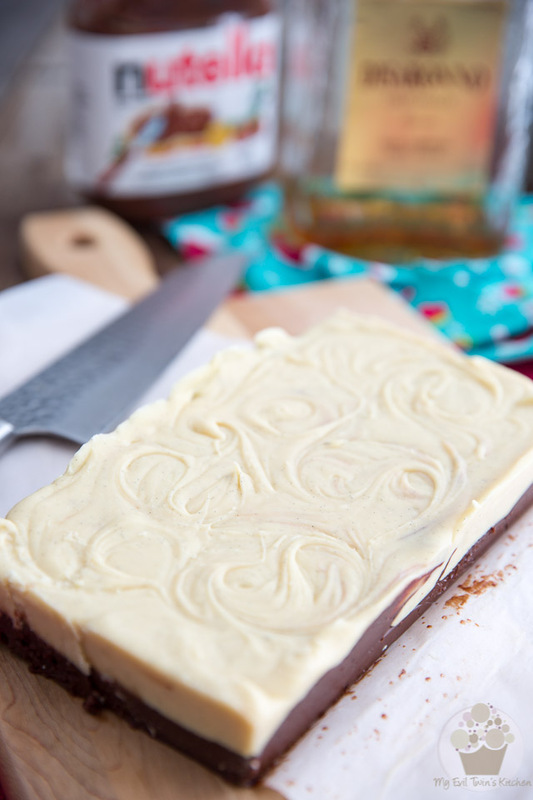 Once your fudge is fully set, carefully remove it from the pan by pulling on the parchment paper and place it on a cutting board. 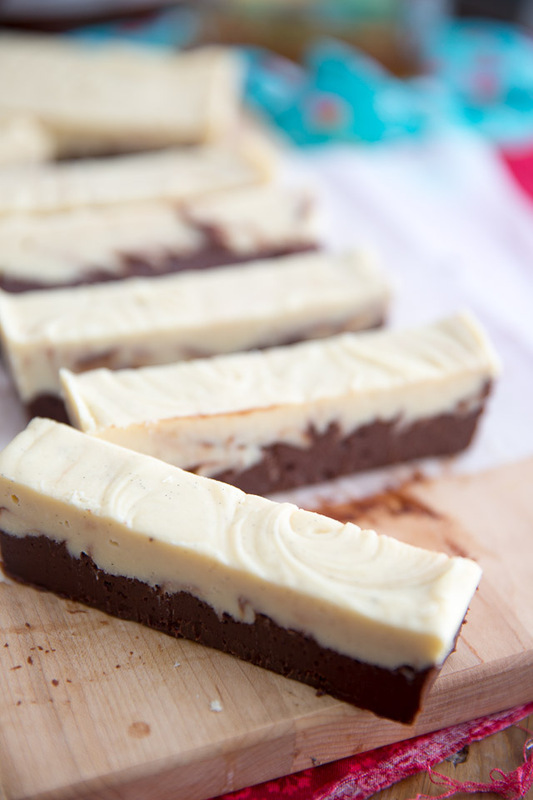 With the help of a sharp knife, cut the fudge into 9 strips or 36 squares. 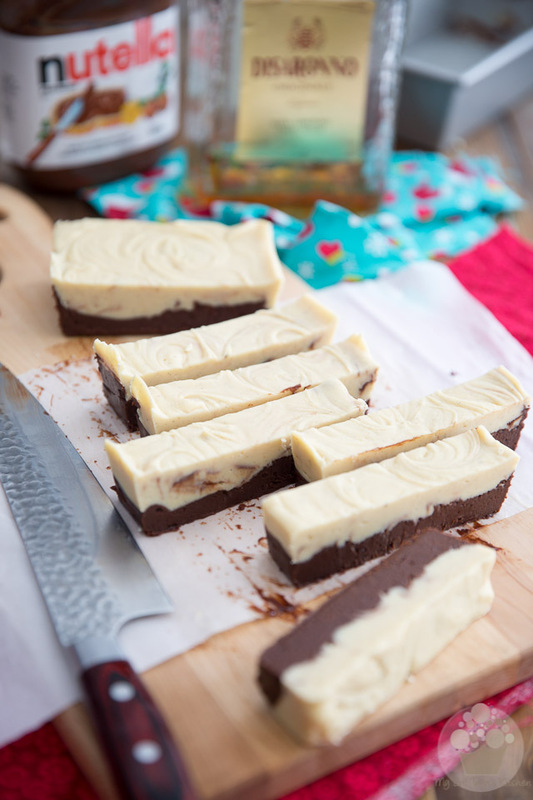 Make sure to wipe your blade with a damp cloth between each cut to keep your fudge nice and clean. Grease the bottom and sides of a loaf pan with butter, then line the pan with parchment paper, leaving a bit of an overhang on the longer sides. 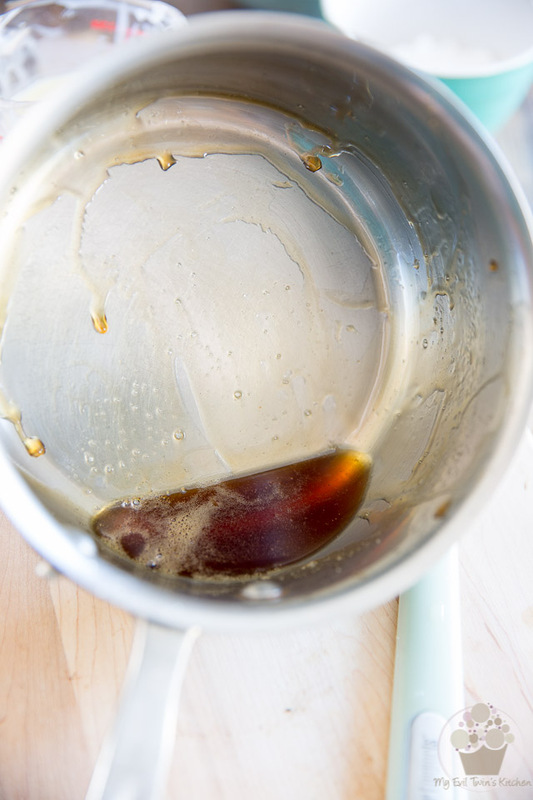 Bring the Amaretto liqueur to a boil and let it simmer until it's reduced down to about 2 tablespoons. 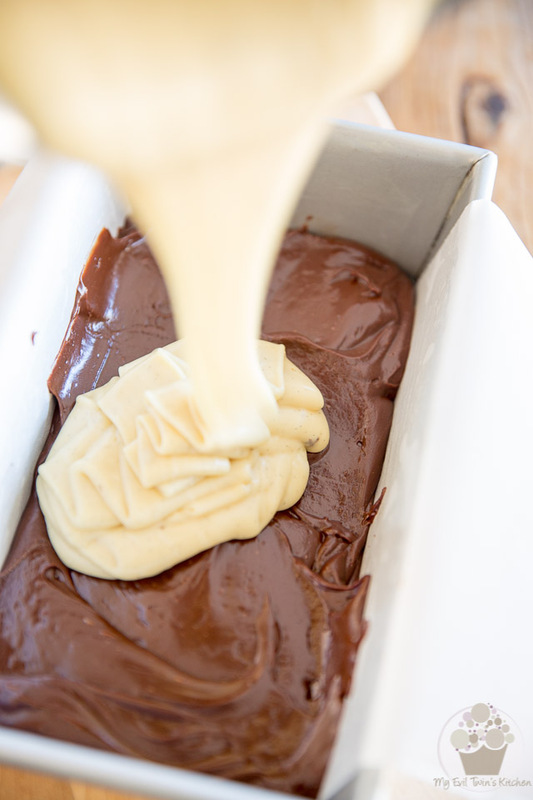 Meanwhile, make the Nutella fudge: combine half a can of sweetened condensed milk, the chopped semi-sweet chocolate, Nutella, butter and salt in a medium-sized bowl. Pour this into the prepared pan and spread all the way to the sides. 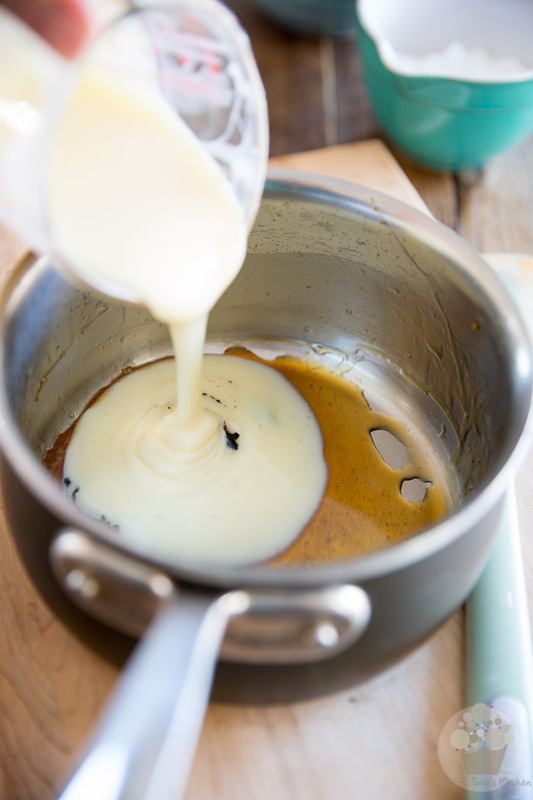 Now make the Amaretto fudge: add the rest of the sweetened condensed milk and seeds from vanilla bean to the pan with the reduced Amaretto. 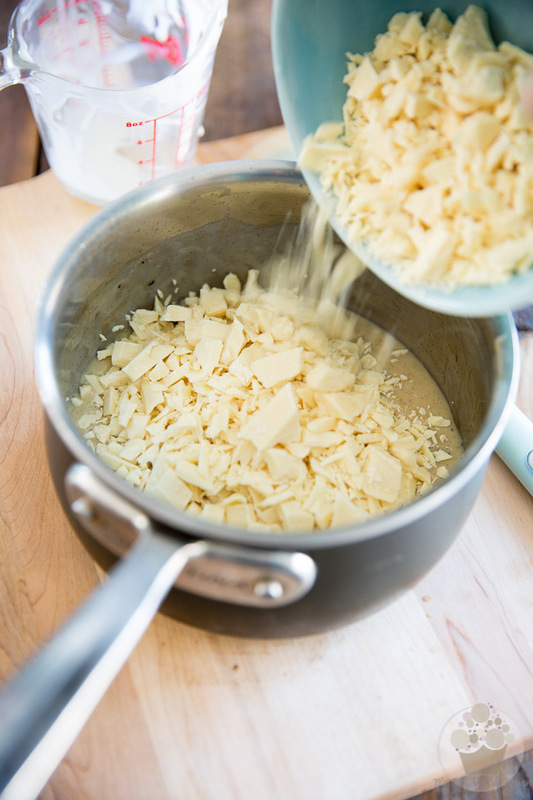 Stir until well combined, then add the chopped white chocolate. 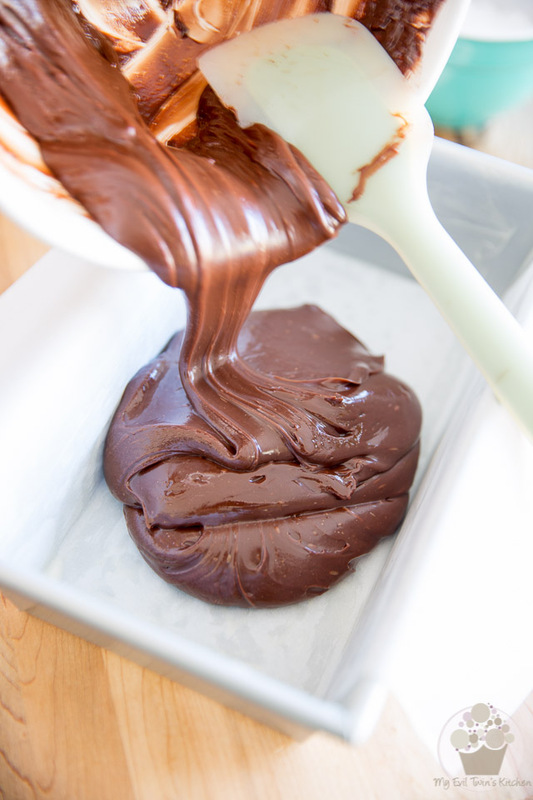 Cook over low heat, stirring constantly, until the chocolate is completely melted and the mixture is silky smooth. 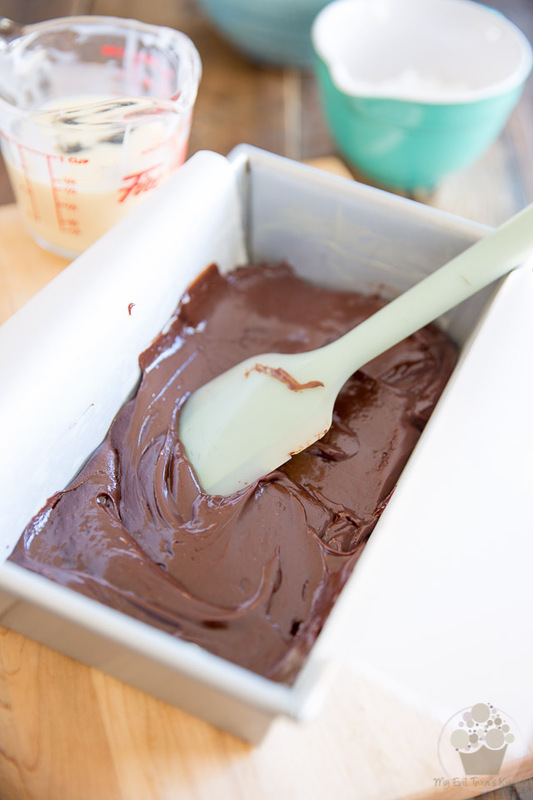 Pour over the Nutella fudge and spread all the way to the sides. 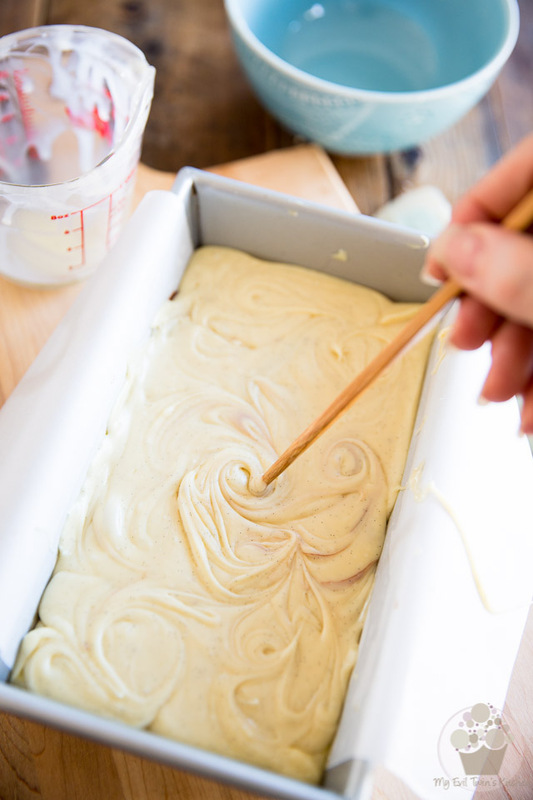 Swirl the fudges with a long wooden skewer or chopstick and refrigerate until firm, about 3 hours. 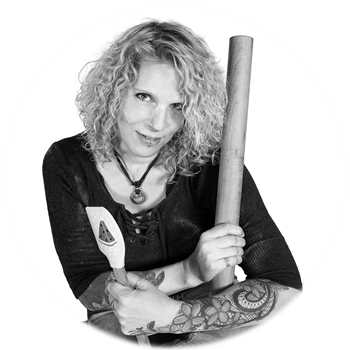 Lift fudge from pan and cut into 36 squares with a sharp knife - wipe your blade with a damp cloth between each cut to keep your fudge clean. FUDGGGGEEEE. 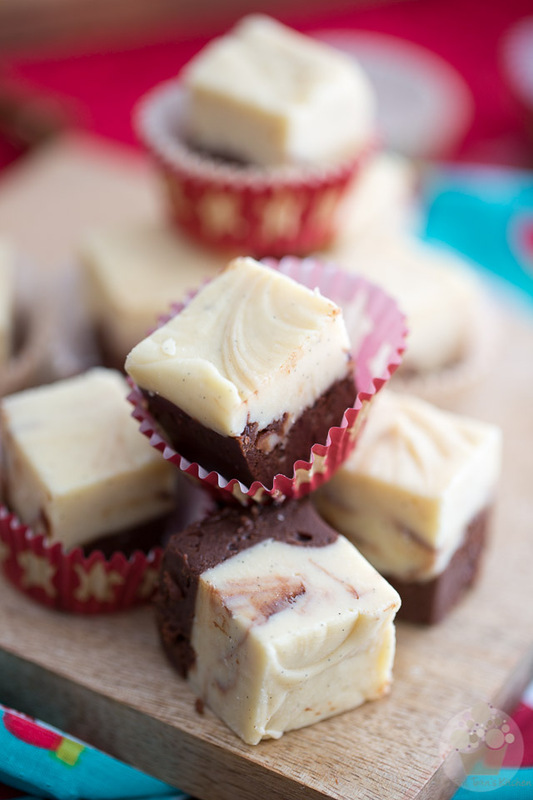 Something about fudge just screams Christmas to me…. question. We don’t do alcohol of any sorts. Thoughts on replacements? Eggnog? I think I would just go with extracts, Jordan. Almond extract would work well to replace the Amaretto… but now you just planted this idea in my mind. 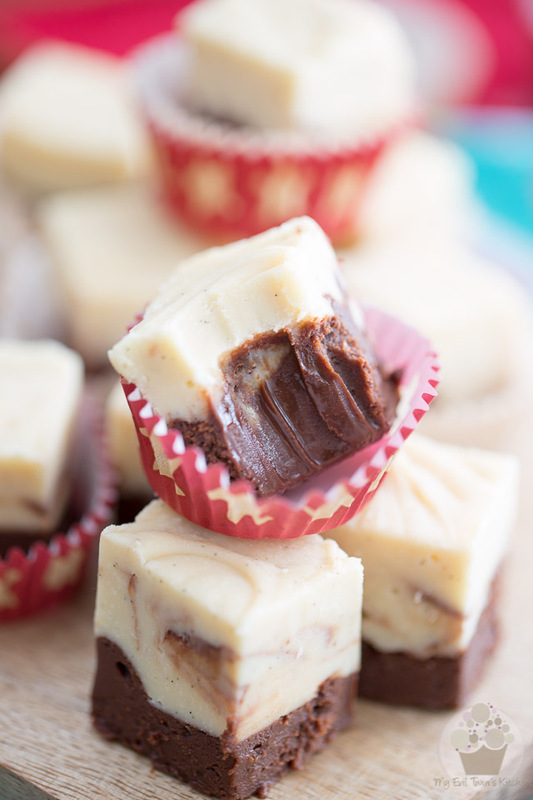 Eggnog fudge. That sounds so incredibly yummy! Devilishly yummy, even. I NEED to make this happen!